Mount Kailas - the most sacred mountain in the world. Uncannily symmetrical, this remote and remarkable peak located in the forbidden land of Tibet might have built by superhuman hands. It stands out of a primordial landscape: a horizontally stratified plinth thousands of feet high, crowned with a perfect cone of pure snow. To Hindus it is the Throne of the great god Shiva. Buddhists associate it with Chakrasamvara, a powerful Tantric deity, and with the sage Milarepa, who fought a magic duel there with a shaman priest in ancient times. 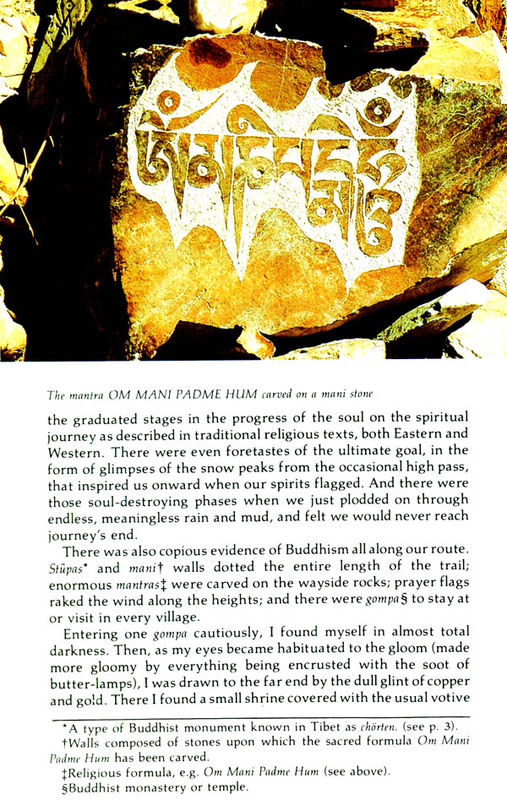 To the Bonpo, the followers of the indigenous religion of Tibet, it is the giant crystal on which their founder, Thonpa Shenrab, descended to earth from the skies. For more than a millennium, Buddhist, Hindu and Bonpa pilgrims have been visiting this Throne of the Gods and performing pious circumabulation around it. 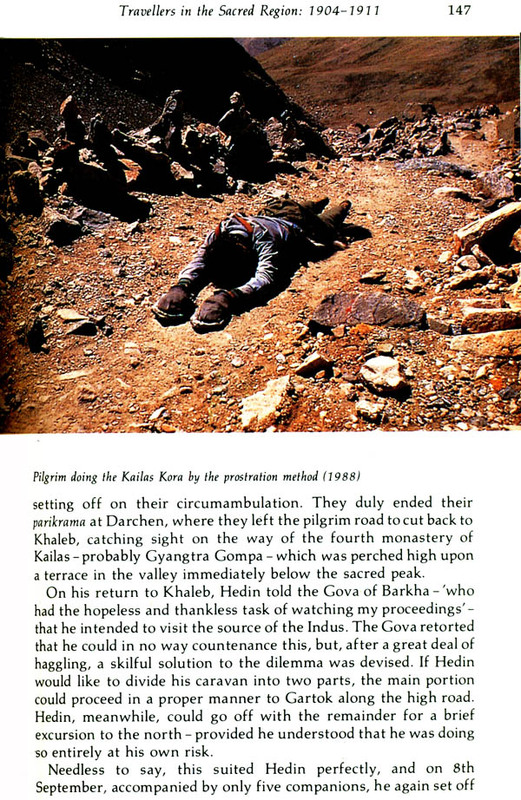 John Snelling recounts their difficult and dangerous pilgrimages and analyzes the spiritual significance of Kailas - and of sacred mountains in general. 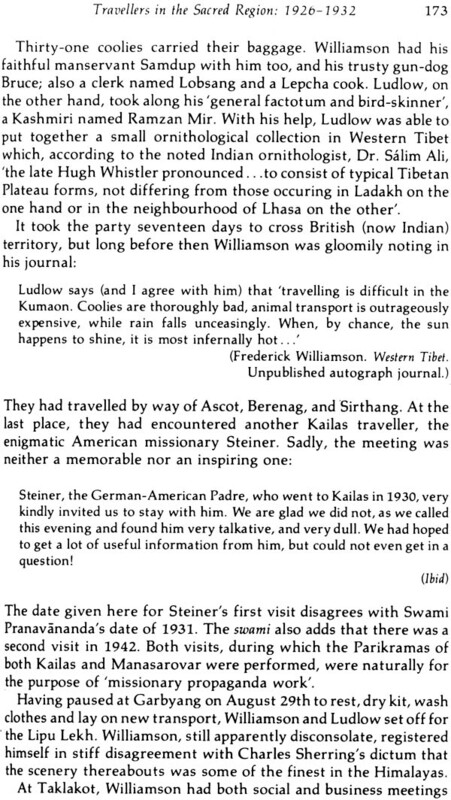 He also retells the tales of the handful of Western travellers who reached Kailas between 1715 and 1949 - an exclusive club of intrepid explorers, mountaineers, big game hunters and officials. 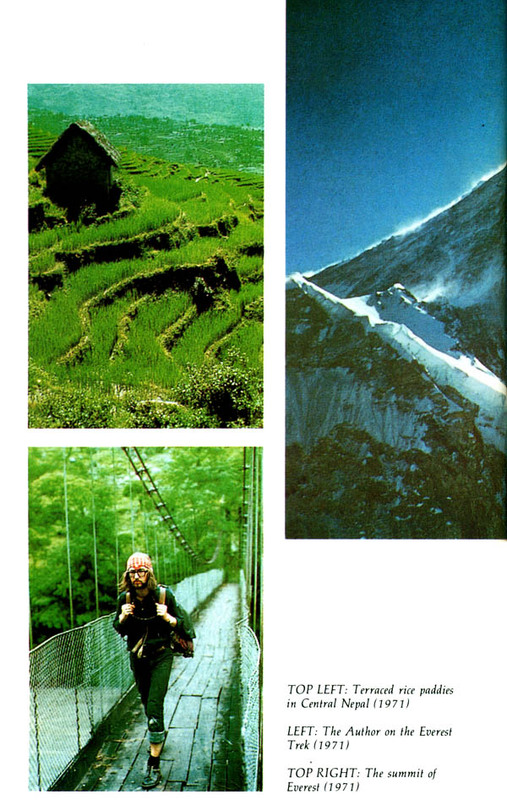 Then in 1984 the Chinese so the tales of a new wave of contemporary travellers have in this completely revised and enlarge edition been added to those of their great prec1ursors. 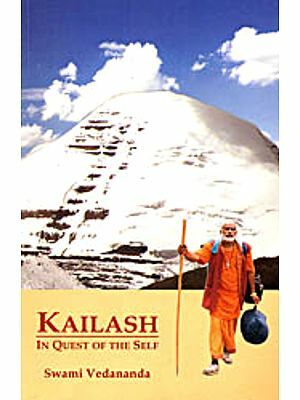 The new edition of this acclaimed travel book is particularly indispensable for all those wishing to visit Mount Kailas, for it contains a comprehensive Guide for Travellers as well as up-to-date maps. 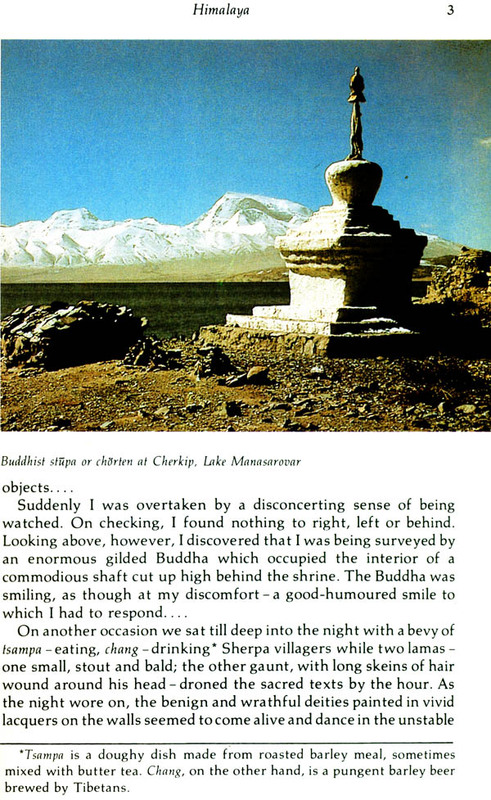 For the armchair traveller there is much to absorb and thrill too - not least the lavish array of photographs, many in colour. John Snelling was born in Wales in 1943 and brought up there as well as in London and Canterbury. After graduating in both English and Philosophy, he lectured at Maidstone College of Art for several years before leaving to travel to the East, where began a serious interest in Oriental religion and philosophy. 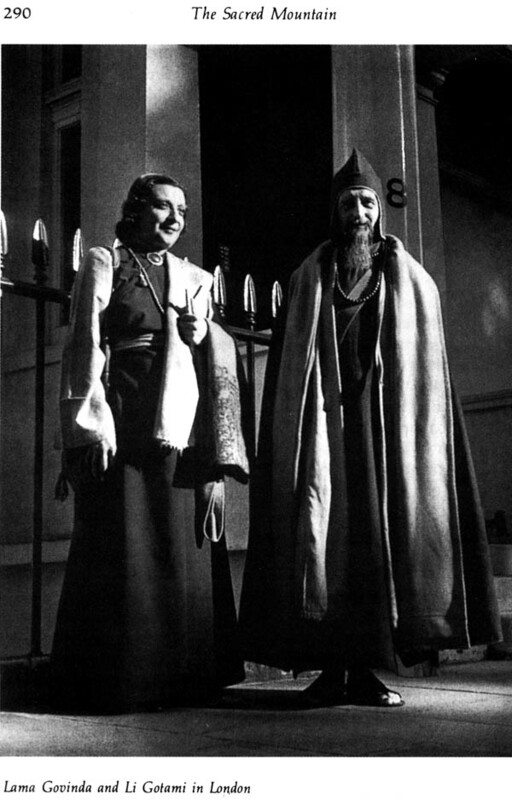 From 1980 to 1984 he was General Secretary of the Buddhist Society and worked with the late Christmas Humphreys Q. C., who founded the Society in 1924. for 8 years from 1980 he edited The Middle Way, the journal of the Buddhist Society. 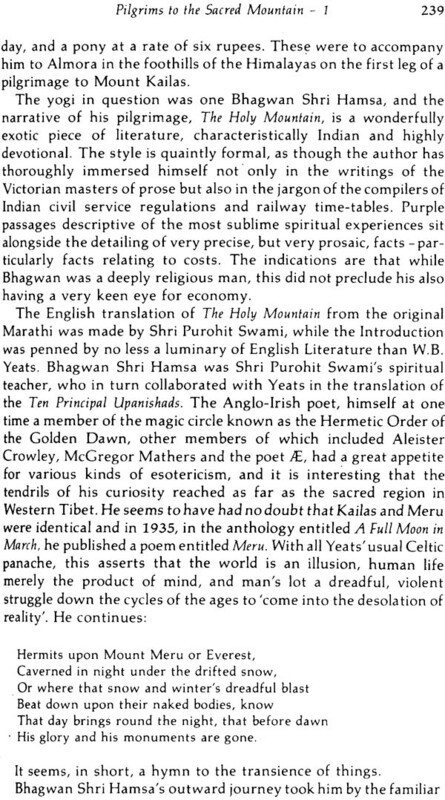 It was founded in 1926 and its distinguished previous editors include the late Alan Watts, whose early writings John Snelling has edited. In addition, he has worked extensively for BBC radio and television as both scriptwriter and presenter. For recreation he enjoys watercolour painting in the traditional English manner. John Snelling has one daughter. He is currently a member of the Sharpham North Community in Devon. A lot of water has passed under the bridge - if that's the right way to put it - since I originally wrote The Sacred Mountain. 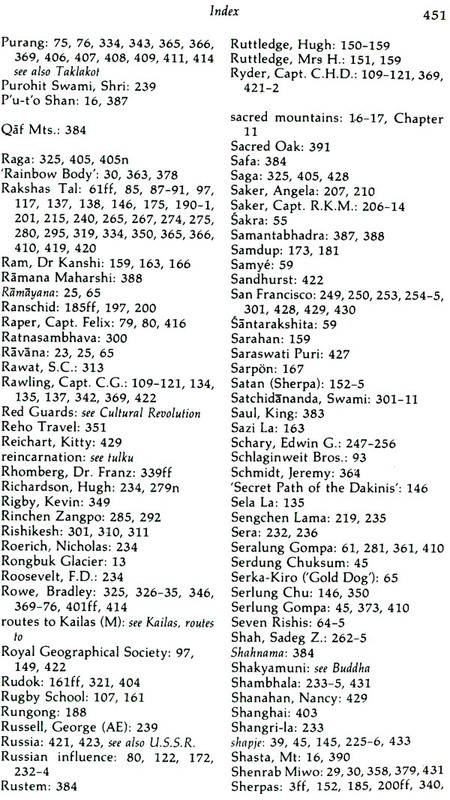 In the first place - and as so often happens with books - much new information arrived after the book had gone to press. 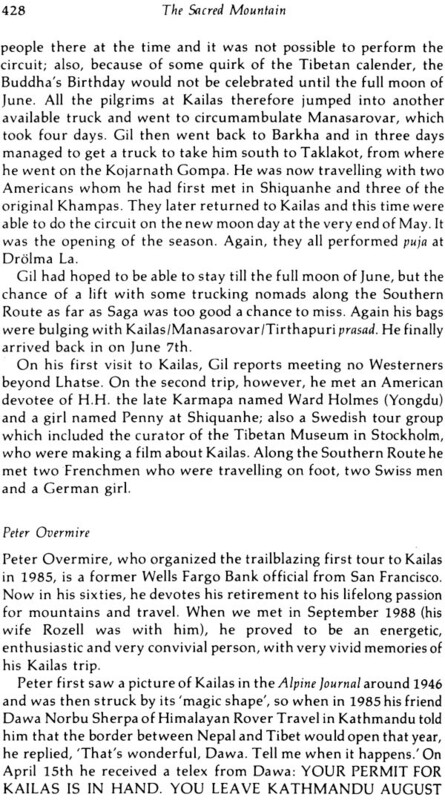 Particularly I met the widows of three Kailas travellers - (it's always the women who seem to survive, and often to' an old age; the men die younger) - Lady Wakefield, the late Mrs Frederick Williamson and Mrs R. K. M. Saker. 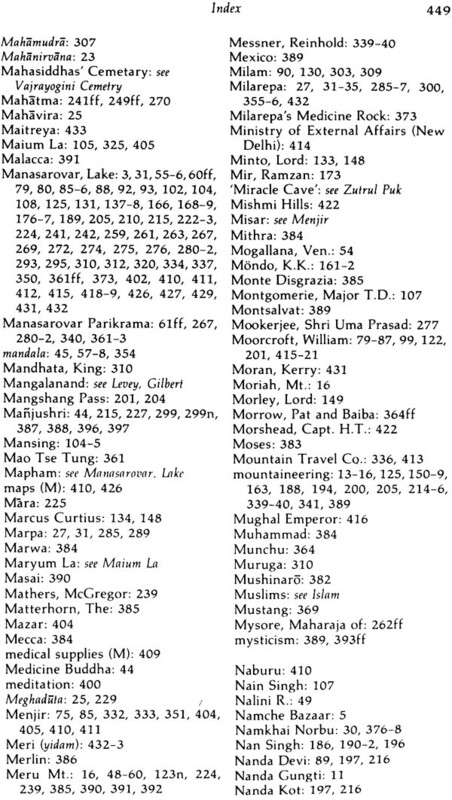 All kindly made available to me both written material, some of it hitherto unpublished, and pictures. I must register my sincere appreciation of their help. In the case of Mrs Williamson, the connection resulted in a fruitful collaboration on a book that recorded Frederick Williamson's life and career and her own part in it. 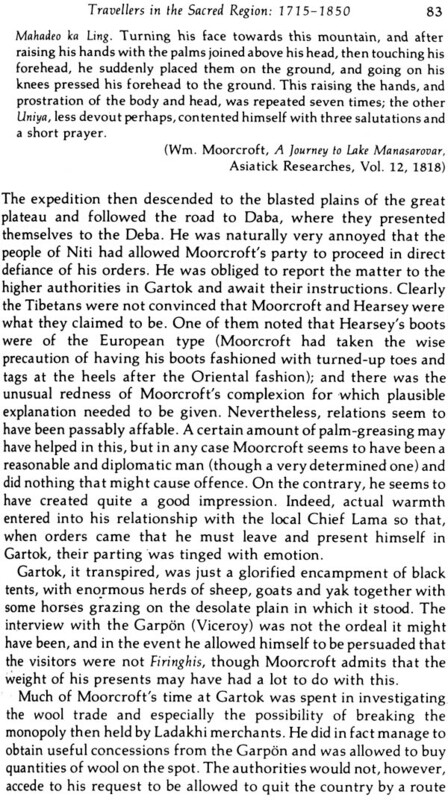 I was also kindly lent Hyder Hearsey's autograph journal of his journey to Western Tibet with the great William Moorcroft by Hearsey's descendant, the late John Hearsey. 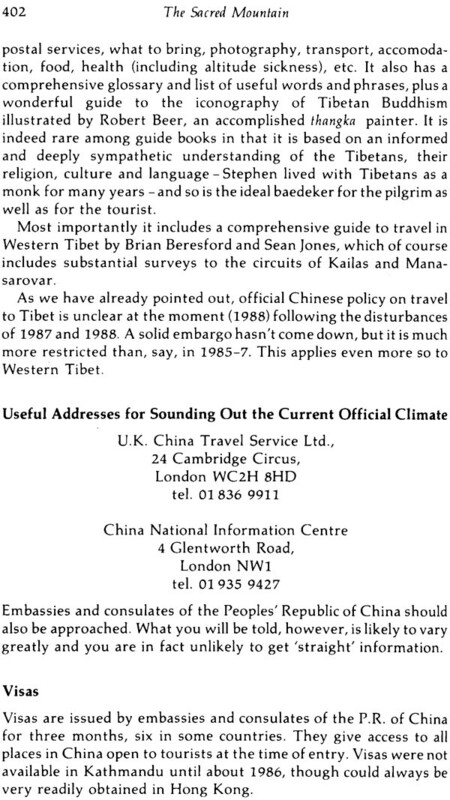 In the second place, dramatic developments in China in the early 1980s resulted in the opening up of Tibet to tourism and a whole new wave of visits to Kailas. 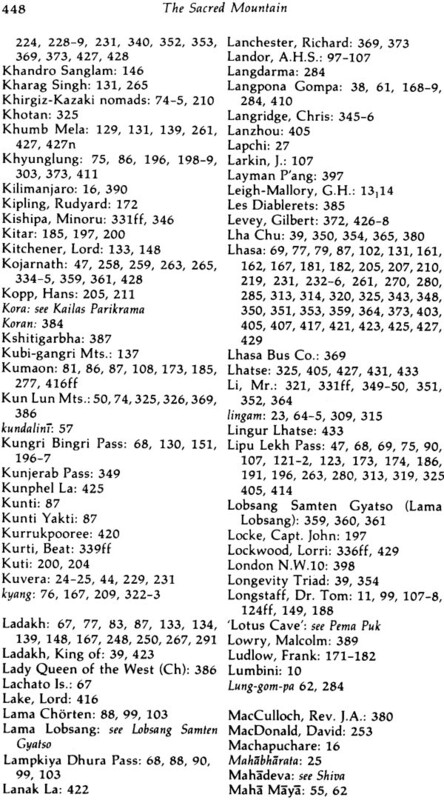 In this new edition we therefore give account of a new generation of Kailas travellers, and I must sincerely thank many of them for either recording their reminis- censes or sending me in some cases very long and informative letters; also for lending photographs and pictures. 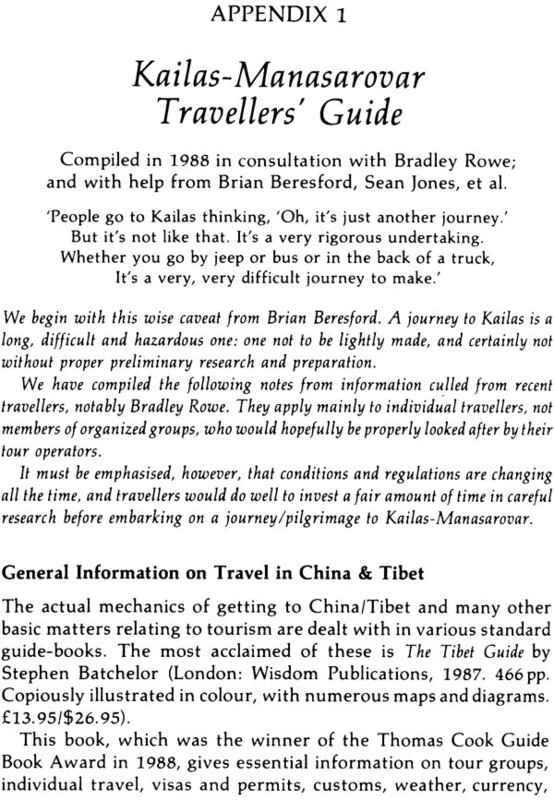 I am particularly indebted to Bradley Rowe, the first European at Kailas since Lama Govinda; also Brian Beresford and Sean Jones, Naomi Duguid, William Forbes, Charlie Foster-Hall, Dr Andre Herold, Peter Overmire, Hugh Swift, Gilbert Levey, Richard Crane and Michael Henss. 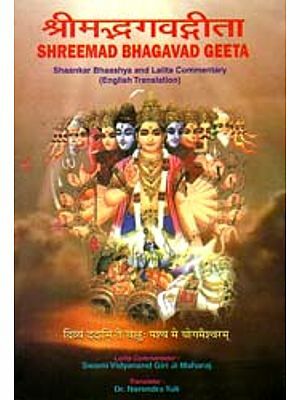 Structurally, even though it was written at a time when Kailas- Manasarovar was closed to outsiders and was something of an enigma, the original text basically stands, though with revisions, corrections and the addition of supplementary material made 'available since publication. 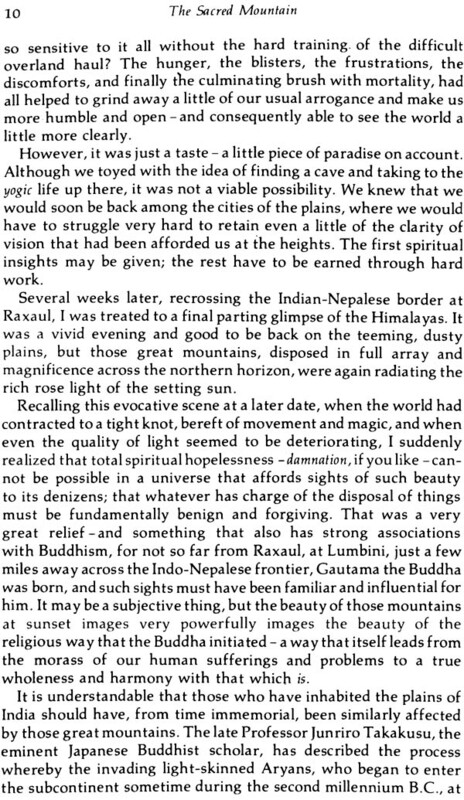 I have not, however, felt moved to change any of my original views on the spiritual significance of Kailas-Manasarovar or of the nature of sacred mountains and the practice of pilgrimage to them. 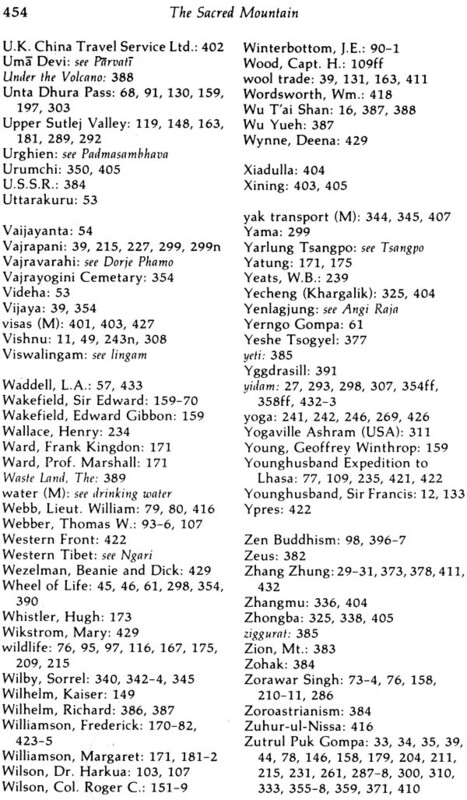 However, I have tried to work out a standardized and more felicitous system of spelling for the Tibetan place-names in the Kailas-Manasarovar region, and for this as well as for much other invaluable advice I am indebted to Stephen Batchelor, author of the excellent Tibet Guide (London: Wisdom Publications, 1987), a person fully conversant with the arcane mysteries of both written and spoken Tibetan. 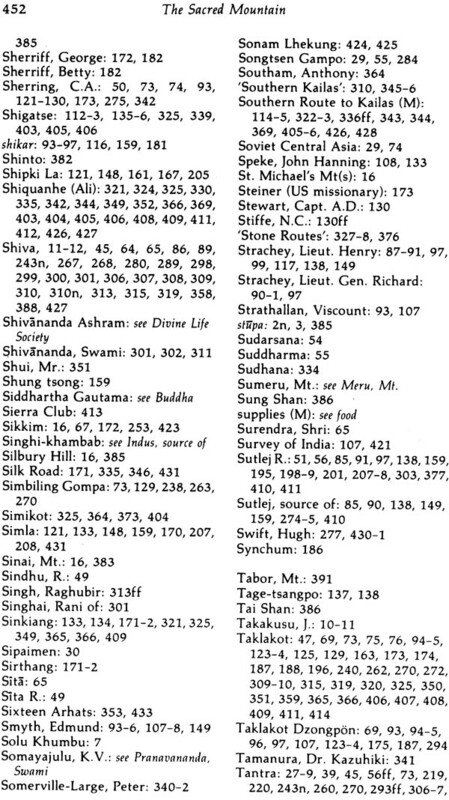 I have also tried to give a more definitive survey of all the sacred sites around Kailas. Other friends who gave much generous help, advice and support, and to whom much thanks is due, include Eva Hookway, who translated German language materials for me; Caille Golding, who read through the additional material and commented on it; and Martine Batchelor. 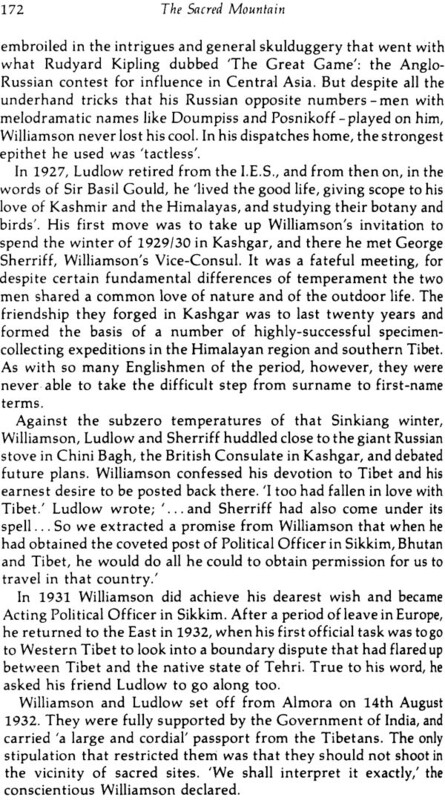 I am also indebted to Hugh Richardson, the last British official stationed in Lhasa, who sent me several pages of close observations on the original text, of which I have taken full note in my revisions. 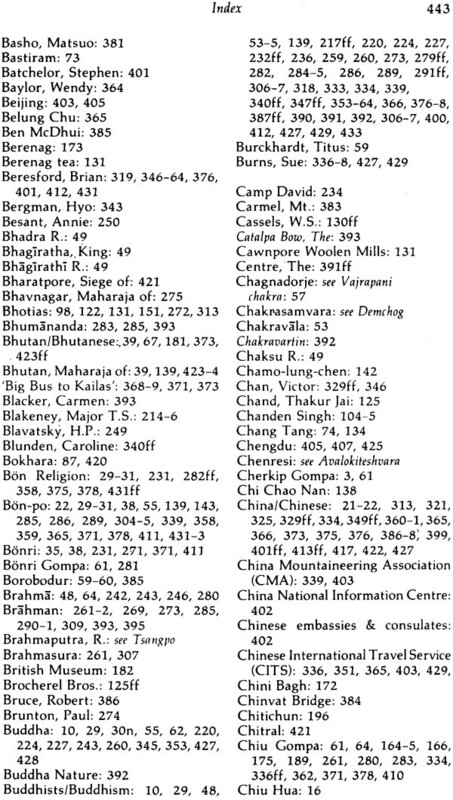 As to what has been added-i.e., material relating to the new wave of post-1981 travellers and pilgrims - this has been inserted near the end of the main text in form of an extra chapter. 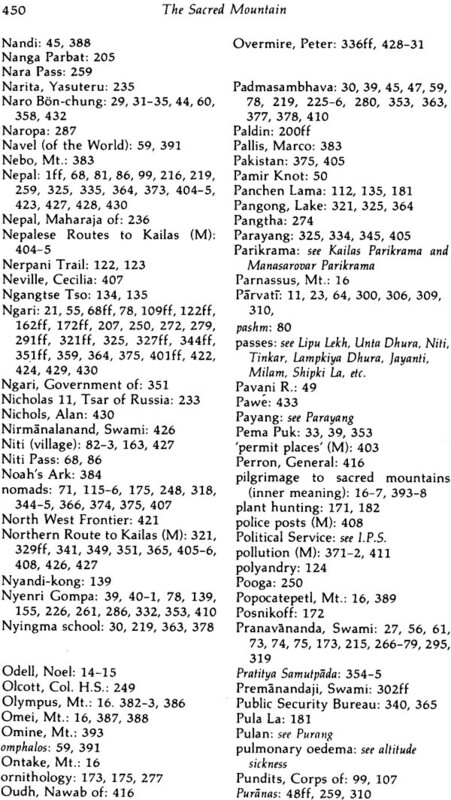 I have also suffixed new material relating to travel in the Kailas-Manasarovar region today and a few appendices that expand on matters raised in the main text. Picasso used to say that, once a still life is arranged, the picture is painted. Something similar happens with books. Sometimes - all too rarely, unfortunately - a good subject arises that simply begs to be written about. It is almost as though it is hovering in the aether, waiting to be drawn down into concrete literary form. 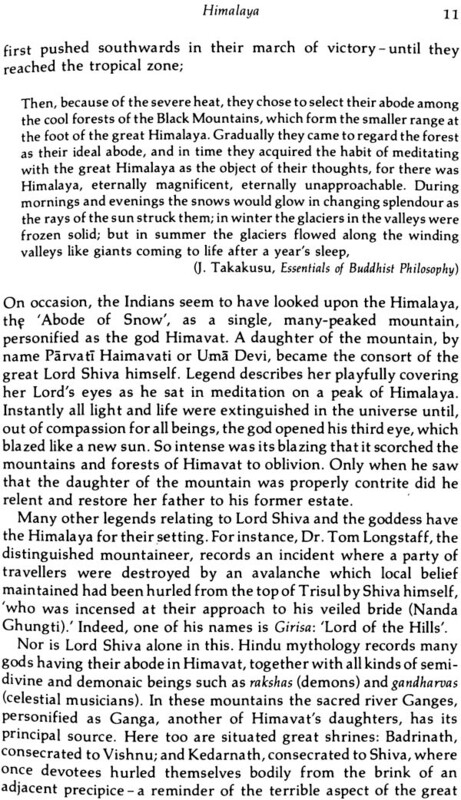 Such was the case with Kailas-Manasarovar. 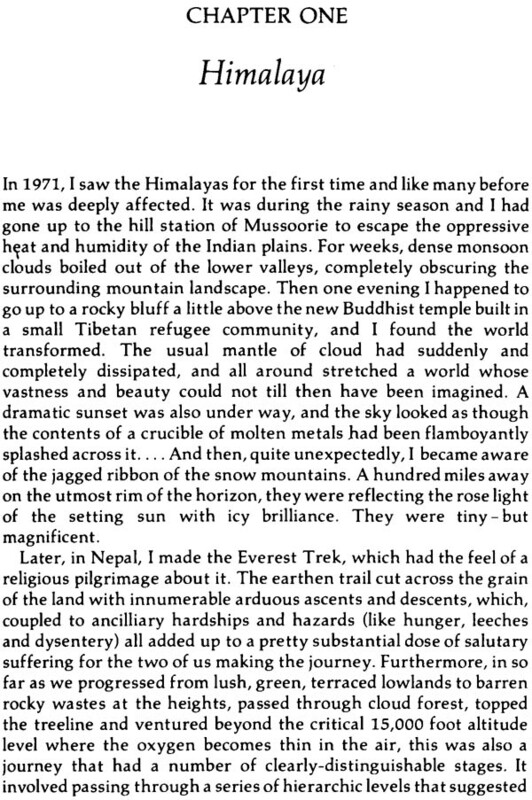 The Sacred Mountain was also my first book and, as with a first love, was in a way sweeter and more satisfying than the others that have come since. I will always harbour a special affection for it. It has won me many good friends and caused many good things to happen. 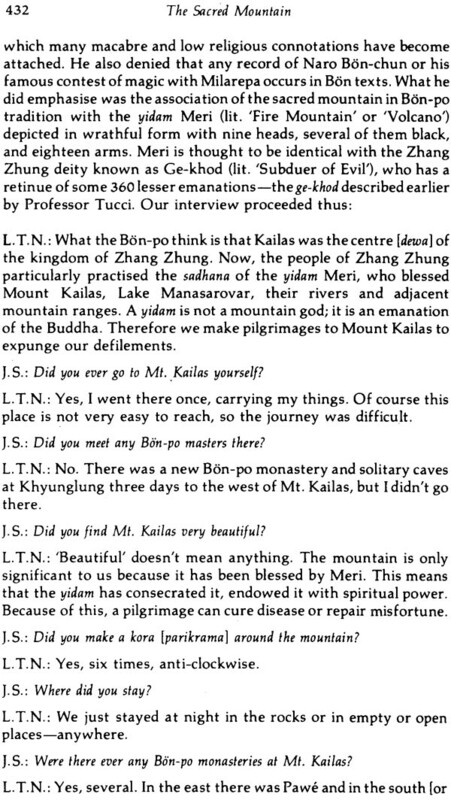 Ironically, however, I have not myself been able to visit Kailas- Manasarovar. 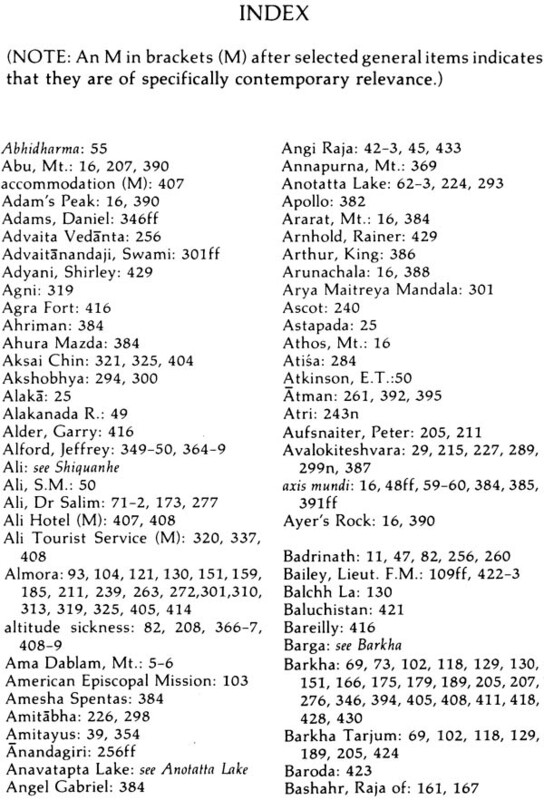 Chronic ill health has prevented me from travelling for almost 15 years. 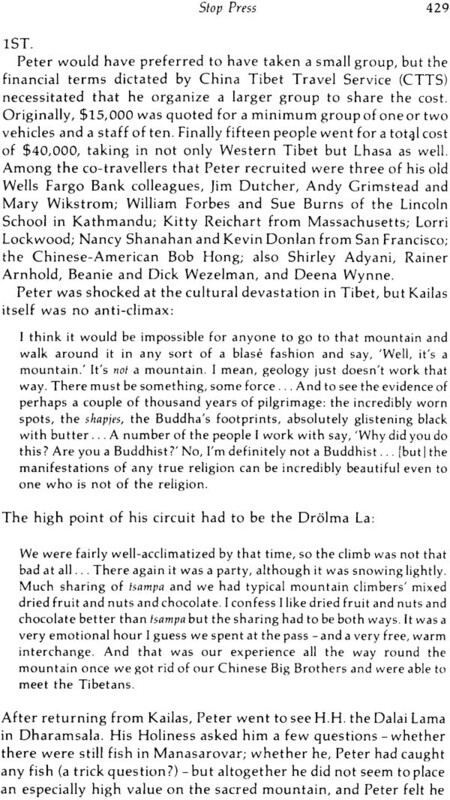 But despite that, I regard myself as a devotee of the sacred mountain and all that it stands for. 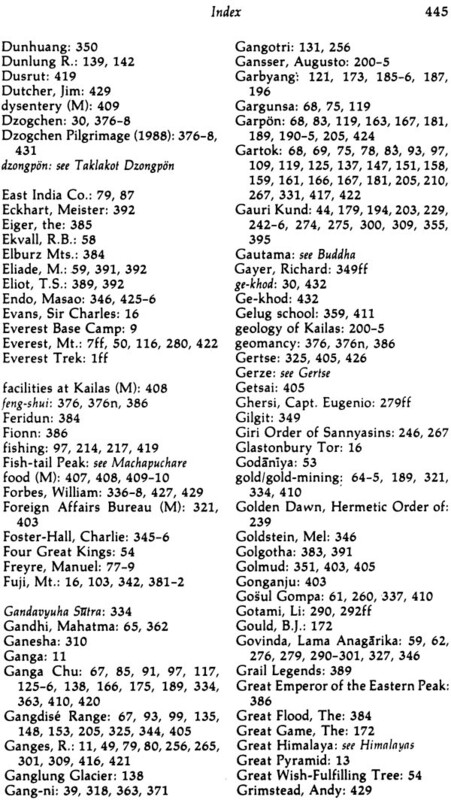 Furthermore, in the last analysis I don't believe one always has to visit a place, even a sacred place, to know what it's about. The creative imagination is endowed with quite wonderful powers; and there's also a sense in which we tune in to a deeper communal consciousness in which all the accumulated experience of the universe is available to us: something like Jung's collective unconscious. Guided by such hidden allies, one can, I believe, get closer to the reality of something like Kailas than, say, someone who goes there in entirely the wrong spirit. 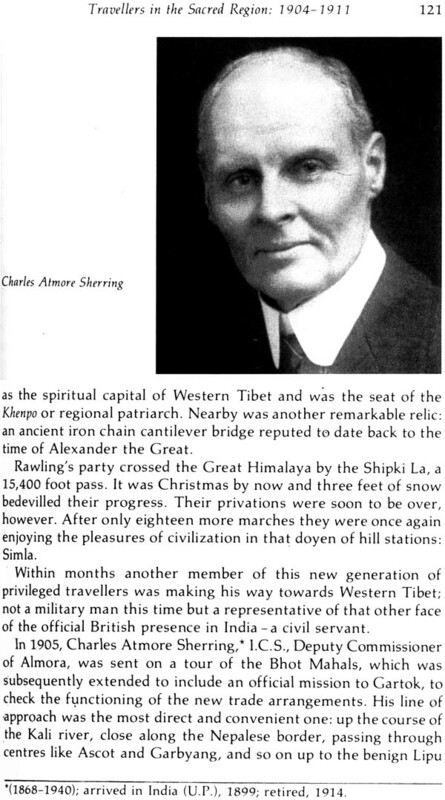 In support of these views, I always cite the case of Arthur Waley the doyen of all Western translators from the Chinese, who himself never went to China and never really wanted to go, believing that to do so might blunt rather than sharpen his understanding of its ancient culture. Also I have one very powerful testimonial. I met Sean Jones shortly after he came back from Kailas at a slide show he gave at Manjushri London, a Tibetan Buddhist Centre run by Geshe Namgyal Wangchen. "I read your book," Sean told me in his blunt way. "It was very accurate." 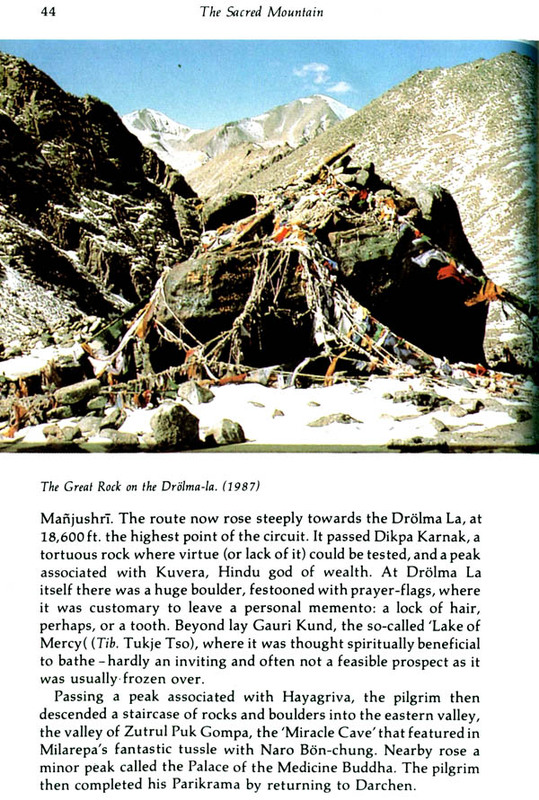 Amongst other sites of natural splendour, Mount Kailas and its environs have a special symbolic value for Tibetans. The region has been an undisputed part of Tibet since the emergence of the Tibetan nation, while the sacred peak has equally long been a focus of spiritual inspiration. 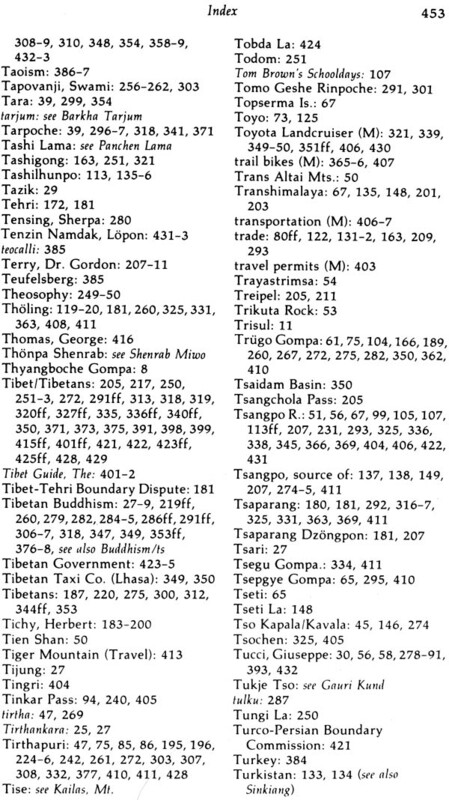 For the early Tibetans who were Bonpos, the area represented the place where Shenrab Miwoche, the founder of their tradition, was born and gave teachings. Later it became an object of Buddhist veneration. 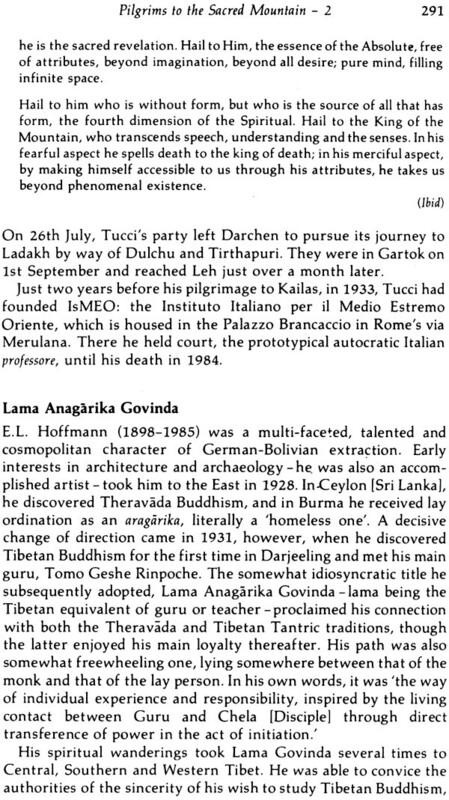 Legends associate it with the Buddha and his immediate followers, with Guru Rinpoche, one of the pioneers of Buddhism in Tibet, and with Tibet's renowned saint, the yogi Milarepa. From the tantric view point too, many regard it as the abode of Chakrasamvara. 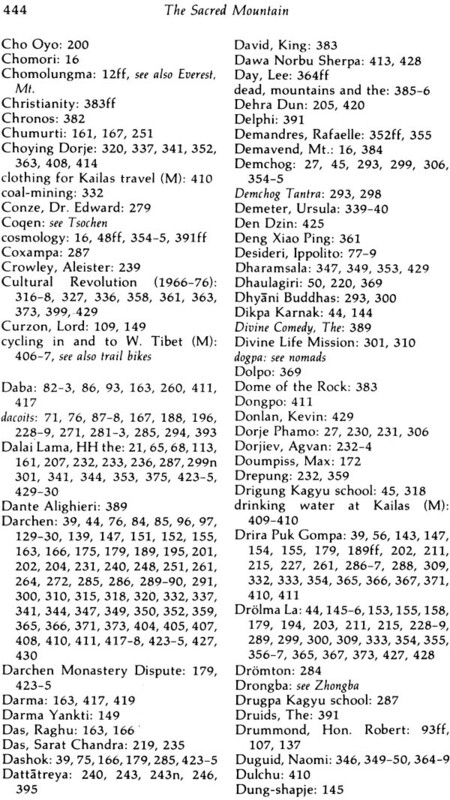 For centuries Tibetans have made arduous pilgrimages, some time the entire breadth of the country, to glimpse the holy peak and perform religious practices at its foot. 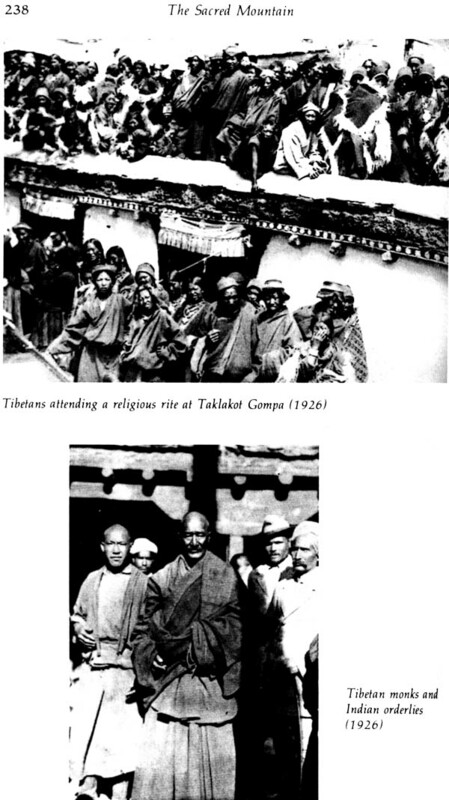 The fact that Hindus and Jains from India, who hold Mount Kailas in equal respect, albeit for different reasons, were free to pursue their own pilgrimages, is indicative of the brotherly relations that always persisted between India and Tibet. 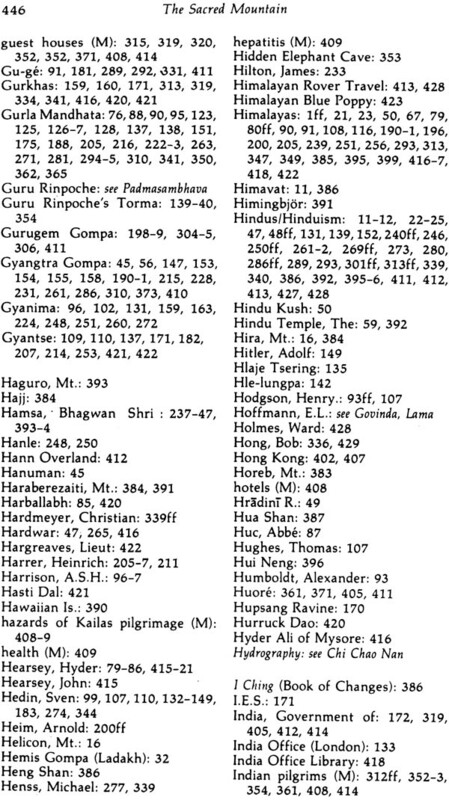 With the tragedy that overtook Tibet in recent years such practices became severely restricted and the surrounding temples and monuments were badly damaged, as in the rest of the country. 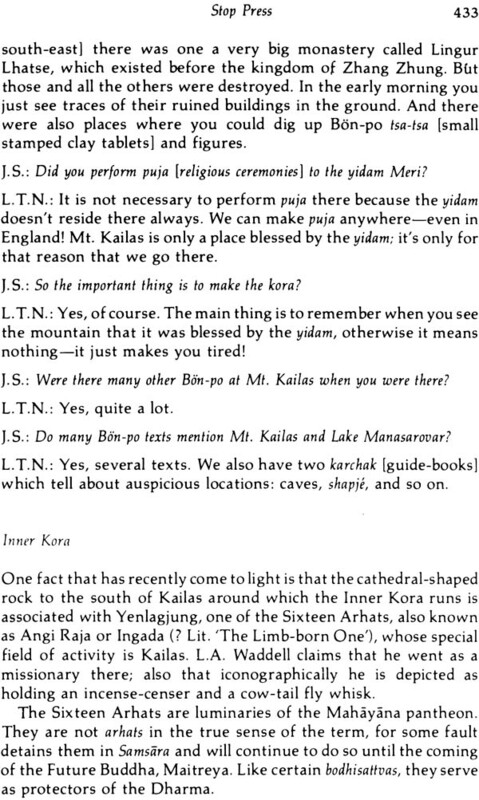 However, lately, as conditions have been slightly relaxed and Tibetans permitted at least the outward trappings of religious practice, they have begun to journey to Kalias once more. Despite the hardships involved, the monasteries and stupas are being rebuilt and people are again engaging in religious practices there. 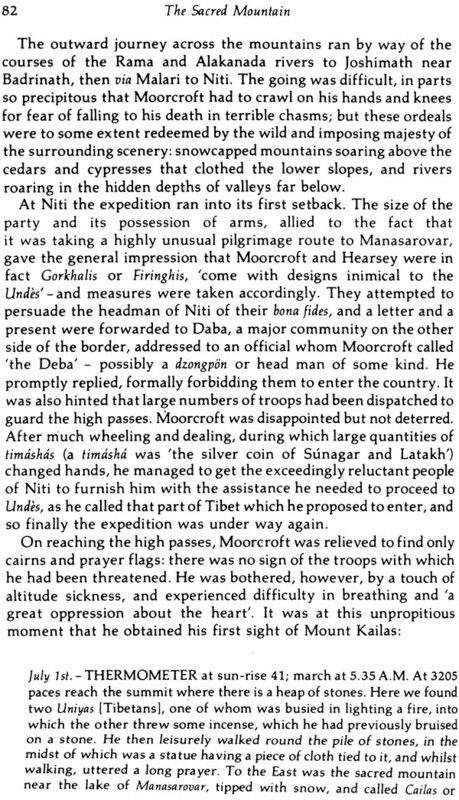 These encouraging signs reveal the enduring fascination of the mountain, the indomitable spirit of the Tibetan people, and the continuing strength; of their religious outlook. 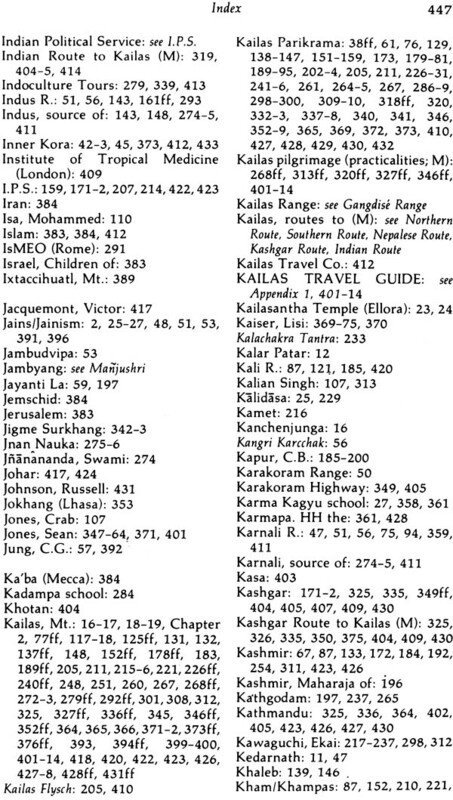 Readers of John Snelling's book, The Sacred Mountain will find accounts o foreign travellers and pilgrims to Mount Kailas. 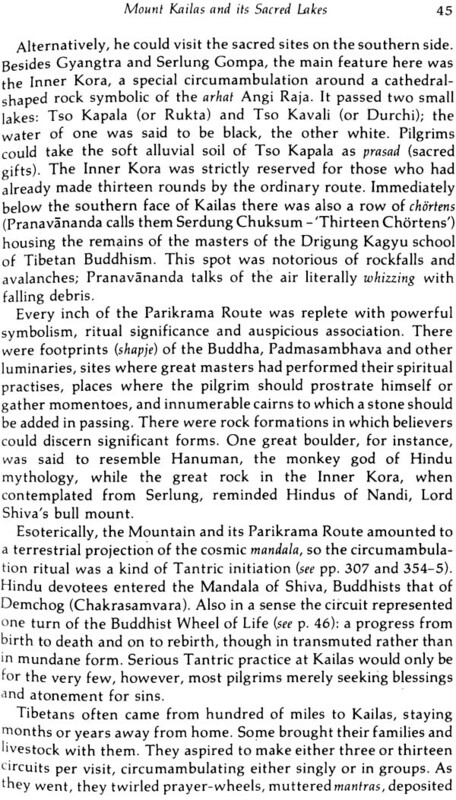 From these they may gain some sense of the awe-inspiring physical presence of the peak itself, and the spiritual ideals that lead pilgrims to it.